For a cold Thursday night in the capital, Finland’s foremost purveyors of prog/alt-rock/quasi-symphonic grunge draw a sizeable and, more to the point, enthusiastic crowd. Extra kudos points too for making the new album War Is Over the focus of their set: in all, they play six of its 10 tracks tonight, including the 12-minute title number. In fact, the three brothers – Mikko (the one with the flicky hair) on vocals/guitar, Kie (the one with the hat) on guitar/vocals, and Jonne (the one with the man bun) on bass/vocals, with additional help from a pair of non-Von Hertzens on keyboards and drums – open with War Is Over. In the process, they manage to recreate onstage the soaring splendour and nuanced dynamics of the studio version. There are choral parts that posit VHB as a hard-rock harmony band – Crosby, Stills, Nash & Din, anyone? – and it all builds towards a huge, rocking crescendo, as though it’s the end of the show already. Fortunately, there are still a dozen blasts of hymnal heaviness to go. The Arsonist is catchy riff rock that has taken the mere weeks since its release to insinuate its way into the assembled throng’s collective cerebral cortex, hence the fist-punching and singing along from the audience, who apparently even forgive the somewhat hackneyed ‘You’re a liar/You set my soul on fire’ rhyme. “It’s good to be back in London town,” Mikko tells an appreciative crowd, ahead of Jerusalem (not the William Blake one, although we feel sure he’d dig it). Coming Home, from 2013’s Nine Lives, is greeted with cheers, and why not? It sounds like a dirtier Highway Star and is both catchy and heavy – the two are not mutually exclusive. Miracle, the opening song from 2011’s Stars Aligned, features pure, high, unison vocals and deep, growling bass. Long Lost Sailor is thunderously urgent and melodically engaging, like a heavy version of Yes (Yes circa Drama, basically). Kiss A Wish is 10 minutes of moody jazz prog complexity, and by Flowers And Rust, Prog’s Anthem of 2013, Mikko is dripping with sweat. Gloria – “the anthem of the Brothers”, according to Mikko – is as tempo-twitchy as Mew/Muse, while Beyond The Storm is as stern and severe, staccato and stentorian, as you could wish. 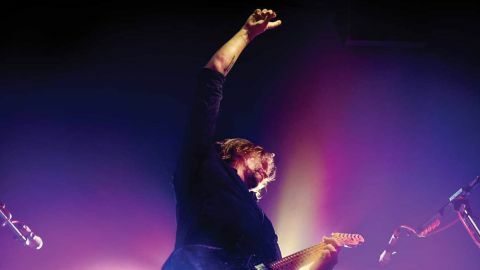 There are two encores – Insomniac and New Day Rising – by which point Von Hertzen Brothers are surfing from peak to peak.